George Enescu” Memorial House is situated on the right bank of the Prahova River, in the small city of Sinaia. Named by the artist himself, the “Luminiş” Mansion stands for a place for both rest and divine inspiration, reflecting the complex personality of its founder: the great Romanian musician George Enescu (1881-1955). In fact, the “Luminiş” Mansion was built between 1923-1927 by the architect Radu Octavian Dudescu accordingly to the sketches of the Romanian musician himself, detail which reveals another side of Enescu’s creative talent. Although George Enescu was born in a small village in Moldova, Liveni, he was strongly attached to the Sinaia city due to the beautiful and inspiring scenery of the Bucegi Mountains and the Prahova Valley. Moreover, in the small city of Sinaia, George Enescu found the first and most important support for his artistic career in the person of Queen Elizabeth of Romania who was herself a writer hiding her real identity under the pseudonym of Carmen Sylva. Convinced of Enescu’s promising talent, Queen Elizabeth offered the young artist a quiet room in the Peleş Castle where he could study and free his imagination. Therefore, the Peleş Castle’s cultural soirees were the ones which promoted Enescu as a promising young musician. The architecture of the Luminiş Mansion combines elements of the Romanian architectural style which prevail with elements with a foreign touch: Oriental embellishments and Biedermeier pieces of furniture. However, there is a sharp contrast between the simplicity of the façade, the oriel and the bedroom of the artist which bears a resemblance to the rustic room of his childhood and the complexity of Maria Cantacuzino Enescu’s bedroom which reveals the eclectic spirit of the artist’s wife. For George Enescu, the Luminiş Mansion used to be both a resting place, as well as an inspiring setting for some of his important works, such as the two Romanian Rapsodies and various sonatas and orchestral suites. We should not forget that here, at the Luminiş Mansion it was also composed “Oedipe”, the artist’s dearest work that cost him “months of work and years of unrest”. In the music room there is still to be found the Maestro’s piano, an Ibach piece, brought from Lausanne, Switzerland. However, Enescu’s favourite place remains the attic, a quiet place where he used to write his works, inspired by a dreamlike setting. Nowadays, the rooms in the attic host some important biographic documents of George Enescu, presenting both his private life, as well as his musical path. In 1946, due to the communists’ repressive acts against the Romanian artists, Enescu permanently leaves the country. After his establishment in Paris, France, he donates the Luminiş Mansion to the state, transforming it into a place for rest for both Romanian and foreign artists. Nowadays, the Luminiş Mansion hosts various concerts, exhibitions, cultural soirees and artistic courses. The spirit of the great musician George Enescu is still to be found in the mute of the music accompanying the visitors in every room, in the prevalent architectural style of the house, the Maestro’s piano and his manuscripts. George Enescu’s complex personality fascinated many artists who dedicated some of their works to the famous musician. For instance, the entrance of the cultural site houses a marble bust of the Maestro, sculpted by Ion Irimescu. 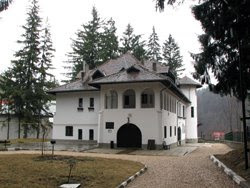 The “George Enescu” Memorial House can be visited daily, except on Mondays, between 9 a.m. and 3 p.m. Don’t let the history’s dust lay down on one of the fewest Romanian well-preserved cultural sites!